A member of our "Pipeliner" online family shared an experience the other day in the comment section, to which we immediately featured because it highlighted a major problem, not only here in America, but worldwide. The part of the comment that led to this article, via Lillith: " So I'm in the middle of ice storm warning for the next several days sitting here watching my local news interviewing people rushing the grocery stores ---are they buying canned goods... are they buying bottled water ? LOL oh LOL ... I see microwavable meals in their carts-- I sh*t you not and frozen meals that you can stick in the oven -- People in United States by and large are doomed if War comes to US soil if they can't freaking know how to ride out an ice storm." I read that comment right on the heels of seeing a Daily Mail report which mainly focused on a task given to students at Leicester University to calculate the exact amount of time it would take for a zombie virus to infect every individual on Earth. Aside from the fact that their tips and advice would most likely lead to most of humanity being wiped out, in the event of a Zombie apocalypse, the statistics provided from an earlier study in October 2016 as to what the 36 percent of UK residents that keep a "grab-bag" in case disaster strikes, actually put into those grab-bags, shows that the majority of the world is so unprepared for a major, life altering disaster, and that more of them would die from a lack of preparedness, than from the catastrophic event itself. The first worrisome statistic, mentioned above, shows that only 36 percent of those sampled in the October study even keep a grab-bag ready in case disaster strikes, meaning 64 percent, should they be forced to run or leave for any reason would be leaving with nothing they couldn't grab from their homes in the time they had before having to bolt. Out of that 36 percent, we see that 61 percent would put food in their bags... nice to know the majority understand they must eat to survive, but what about the other 39 percent? 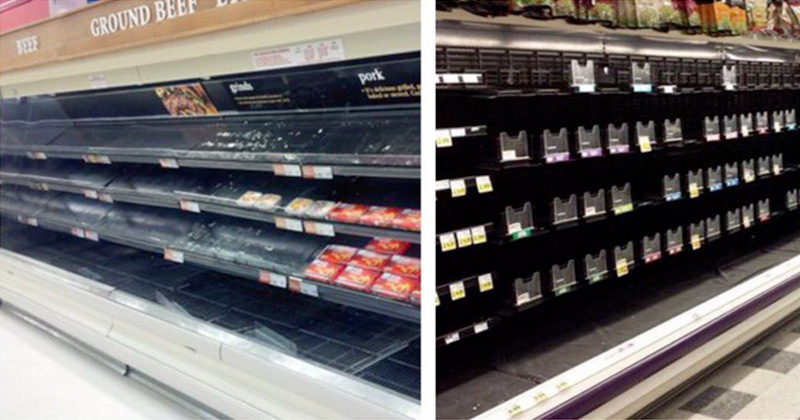 We already know from the January 2016 Winter Storm dubbed Snowmageddon, how fast grocery shelves empty when people panic buy at the last minute, where within hours of the storm bearing down, images started surfacing of empty containers and shelves, so exactly where do those 39 percent of those surveyed think they are going to get food? 53 percent would pack medical supplies, again, a majority, but leaving 47 percent that better hope that on their mad dash to safety they don't injure themselves in any way, cuts lead to infections, sprains need wrapping, those that take prescribed medications would be left without what, in some cases, are life saving meds, where going cold turkey can lead to some serious repercussions. - 22 per cent thought to include matches in their survival kit, while only 10 per cent would take a bottle, which could be used to disinfect water. - 53 per cent) thought that they had the skills to grow crops or rear animals. - 32 per cent believed they could make or repair metal tools. The findings were released by The Big Bang UK Young Scientists & Engineers Fair to mark World Zombie Day on 8th October last year. Here is yet another very interesting statistic: 47 per cent would pack mobile phones, if preparing for a Zombie apocalypse. Granted, the odds of a Zombie apocalypse are practically nil, especially in comparison to preparing for a major weather event, earthquake, tornadoes, volcanoes, hurricanes, depending on what portion of the globe/country they live in, so in some cases, keeping a means of communication is smart, but if a major catastrophic event occurs, chances are your smartphone isn't going to help you survive, since service would likely be unavailable.... and the event in question was World Zombie Day, so I doubt those "Zombies" will be answering your call. According to Columbia University Earth Institute, it was reported in February 2016, that two-thirds of Americans "lack adequate plans and supplies for a disaster, and half of them are not confident in the ability of government to meet the needs of children in a disaster. Many are also not confident that their own communities have adequate plans for dealing with a hurricane, flood or other major event." Nearly two thirds (65 percent) of American households do not have adequate plans and supplies for a disaster. This is virtually unchanged from 2011 (66 percent) and represents only a modest improvement from since 2003 (77 percent). 41 percent are not confident that their community has adequate plans in place for a disaster that occurs with no warning, a slight improvement from 2011. 51 percent are not confident in the ability of government to meet the needs of children in a disaster and 37 percent are not confident in their community’s ability to meet the needs of children. 35 percent of households with children are not familiar with their schools’ evacuation and emergency plans, and 41 percent do not know to what location their children would be evacuated. The only good news I note in those concerning statistics is that over the course of the last 13 years, 11 more percent of Americans have created plans and stocked supplies in the event of disaster, but it still isn't enough because nearly two-thirds of the 324+ million people in America, would be unable to survive without help should a major catastrophic event occur. Let me blunt: 1/3 of a nation cannot possibly save 2/3's of a nation without endangering themselves. Given human nature, a large part of those that are prepared, would try to help those that haven't bothered to prepare, especially if there are children involved, therefore the unprepared are not only at risk, they are putting those that have prepared in danger. With Obama's recent Executive Order on preparing for "Space Weather events," scientists warning of catastrophic earthquakes, the vulnerability of our power grids, EMP threats, or any other number of threats that would not just be considered "disasters," but would be life-threatening catastrophes, more people must prepare. 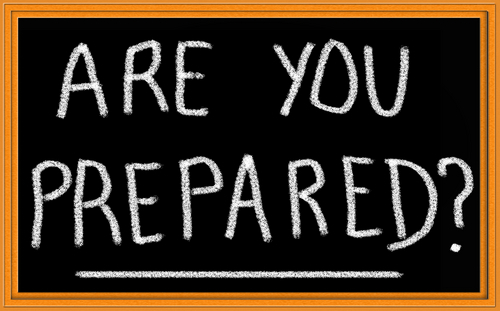 If one is prepared, there no need to fear... we are not telling people to live in fear, we are encouraging everyone to prepare for disaster because life never gives a "trigger warning" before catastrophe strikes. 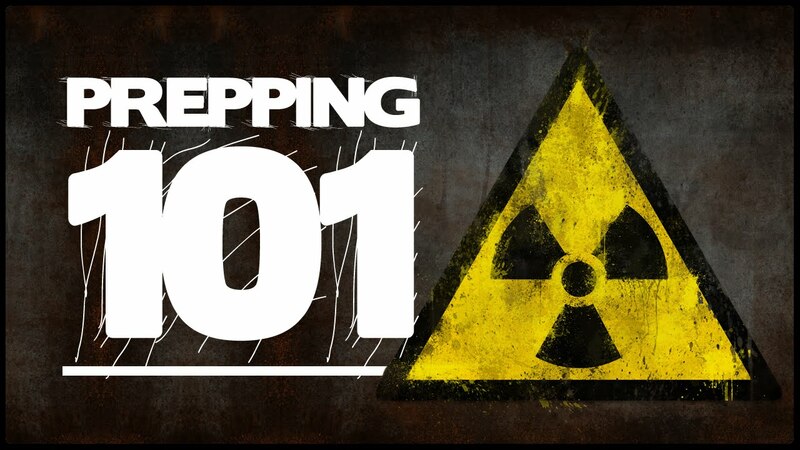 Whether you are new to prepping or someone that has been carefully doing so for years, there is always something seen in prepping discussions to help us all learn more, perhaps offer an idea we didn't think of, so, while we are offering some basic prepping sites and videos below, please feel free to offer your own in the comment section to help others. NOTE- Inevitably you have those that think there is only one way that is the right way, but prepping is dependent on a number of factors, including financial means, so prioritization is key if you are on a budget. For example, if you are just starting out, prioritizing is key, focus on food, water, medical supplies, even if it is just buy something extra each time you shop. Many might say "don't buy canned this or that, because SALT!," yet if it comes down to starving or getting something that will feed you that isn't exactly the best choice health-wise because of your budget, do what you have to, make sure you will be fed, then work towards buying more healthy products as your stocks grow. With such a large number of prepping websites out there, there is no way to list them all, so I will offer a few below, and readers can add their favorites in the comment section to share with each other. Remember prepping is personal, so recommended foods by one person may be something your or your family do not like or cannot eat, so use the information as general guidelines, but always buy what you know YOU will use, what YOU will eat. Excellent video on why prepping is so important and why you cannot count on the government to take care of you and your family in a time of national emergency or disaster. Readers are encouraged to share links, ideas, tips and videos about prepping that they find helpful, in the comment section below.